Artist's concept of a spacecraft studying the huge metal asteroid Psyche from orbit. One of the strangest objects in the solar system may get its first closeup in the coming years. A team of scientists is mapping out a mission to the huge metallic asteroid Psyche, which is thought to be the exposed iron core of a battered and stripped protoplanet. The proposed mission would reveal insights about planet formation processes and the early days of the solar system, its designers say, and would also afford the first-ever good look at an odd class of celestial objects. The huge metal asteroid Psyche may have a strong remnant magnetic field. This SPACE.com infographic takes a look at the strange magnetic asteroid Psyche, which may be all that remains of what was once a protoplanet in the early solar system. See the full Psyche asteroid explainer infographic here. The 155-mile-wide (250 kilometers) Psyche, which lies in the main asteroid belt between Mars and Jupiter, consists largely of iron. Scientists think the object is the nearly naked core of a protoplanet whose overlying rock layers were blasted off by massive collisions long ago. Psyche thus offers a unique opportunity to learn more about the interiors of planets and large moons, whose cores are hidden beneath many miles of rock, Elkins-Tanton said. "This is absolutely the only core-like object that we know about in the entire solar system," she said. A robotic mission to Pysche would also help astronomers take the measure of metal worlds, a type of solar system object that scientists know very little about. The project would beam home the first photos and information ever gathered at such a body. "We know a lot about stony and icy bodies, but what about metal ones?" Elkins-Tanton said. "What does the surface of a metal world look like?" For example, she added, it's possible that material melted and blasted out by large impacts on Psyche solidifies in a sheet before being lost to space, causing metallic curtains of ejecta to jut from the rims of impact craters. 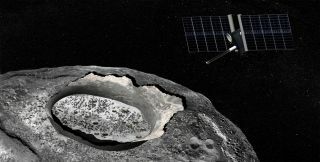 The researchers' Psyche probe would orbit the huge asteroid for about six months, studying the object's topography, surface features, gravity and magnetic field, among other characteristics, Elkins-Tanton said. This simulation shows a "hit-and-run" collision between two large asteroids, the kind of impact that could have stripped the rocky layers from the big metal asteroid Psyche, exposing the protoplanet's iron core. Data gathered by the spacecraft would shed light on how planets began coming together in the first few million years of solar system history, as well as improve scientists' understanding of the interiors of terrestrial planets such as Earth, she added. The team has been working on the concept for about a year and a half and plans to submit it during the next call for NASA Discovery-class missions, which is expected to come in 2015. Discovery missions are lower-cost efforts capped at $425 million in 2010 dollars, excluding launch-vehicle expenses. If selected, the Psyche mission could be ready to launch relatively quickly because it requires no new technology development, Elkins-Tanton said. The spacecraft would be based to a large degree on NASA's Dawn probe, which is currently on its way to the dwarf planet Ceres after wrapping up a 14-month campaign at another giant body in the asteroid belt, the protoplanet Vesta.